Does Facebook make you spend more? When we think of Facebook we think of connecting with friends and family, posting pictures and browsing through other people's pictures to see what they've been up to (only occasionally though right?). We don't think of going on a "Facebook shopping spree" so why is it that recently do we find ourselves pulling out our credit cards and making purchases before sending a message to our dear Aunt Ida? Hundreds of studies have been done, not to know WHY we do this, but more importantly HOW. How can Facebook make more money? Enter Facebook advertising and the manipulation of impulse purchases. Now more than ever Facebook has become a mall in itself, using key words like "sale", "exclusive", "limited" and our favourite: "free". Yes the words alone could be seen as innocent promotional incentives, but the bigger picture isn't "innocent" and without a monthly budget to stick to could easily put you in serious debt. Impulse buying is connected to and can cause: anxiety, unhappiness and financial stress. Sometimes (without even noticing it), we purchase clothes, apps and other products to improve our mood, to look better in front of others, or simply because we lack the self-discipline to resist the temptation of another little black dress. Whatever the reason is it can have the opposite effect and cause us, instead having to deal with, credit card bills and added interest. A professional monthly budget is a great tool to steer you clear of these kinds of dangers. How can we avoid this? As tempted as I am to tell you to just simply ask yourself if you REALLY need it before you buy it, I know it's not realistic! I asked myself if I needed the coffee I just had before buying it, I told myself no, whilst walking away with coffee in hand. 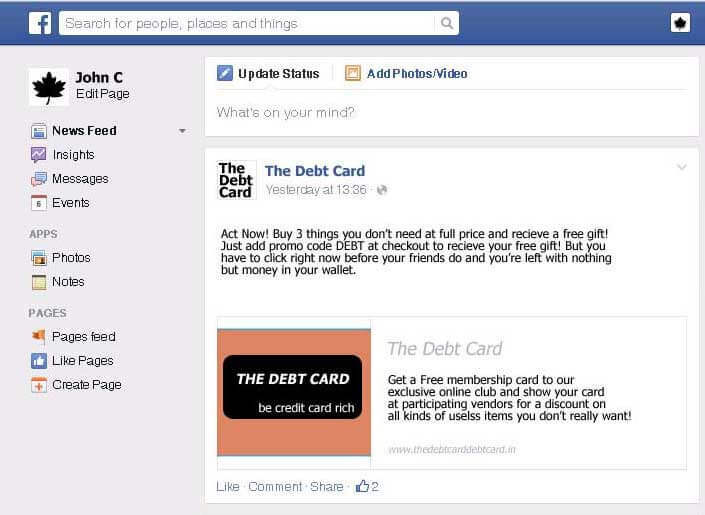 1) Create a monthly budget that incorporates a budget allocated to Facebook shopping sprees. Maybe you know you find better deals online, which is great, just make sure to stick to your budget and make sure you don't go overboard. 2) Keep a short list handy of past purchases. A lot of times when buying online we buy things that we purchased already, and that simply haven't come in the mail yet. No one needs two red lipsticks in one month! 3) If you're dealing with credit card debt already, staying away from using the card for material products is necessary. Find a new hobby, TV show or book to enjoy during the time you would usually be on Facebook shopping. 4) Use a debit/credit card. Some credit cards allow you to access your debit account when using your credit card, this would ensure you're spending money you already have, instead of racking up interest and making a $30 dress cost you $100 in the long run. 5) Be aware of shipping fees. Try to purchase the majority of your purchases from the same company to avoid paying multiple shipping fees, if not you may as well have gone to the mall! 6) Understand what you're buying and why. There may be patterns in your purchases that go with your moods, and making sure you are happy and healthy is more important than any credit card purchase.